#16 North Carolina is hosting #20 Clemson and took game two 9-5 to secure the series. #5 Arizona State also secured a series with a 3-1 win over #24 Oregon. #22 Oregon State evened the series at #18 Arizona with a 10-4 win. Justin Jones – LHP – California – So. 9IP 7H 1ER 1BB 12K. (W, 4-1). Austin Wood – RHP – USC – Jr. .2IP 4H 4ER 0BB 0K. (L, 1-5). Jordan Pries – RHP – Stanford – Jr. 7IP 5H 2ER 2BB 7K. (W, 4-1). After blowing a lead on Friday, Stanford rolls over Washington State 22-3 on Saturday. Brian Johnson – LHP – Florida – So. 5.1IP 4H 2ER 1BB 5K. Kevin Gausman – RHP – LSU – Fr. 2.1IP 6H 6ER 2BB 3K. (W, 2-3) Rough outing for Freshman as LSU falls to Ole Miss 16-3. Hoby Milner – LHP – Texas – So. 6.1IP 3H 2ER 2BB 2K. (W, 3-1). Michael Wacha – RHP – Texas A&M – So. 6.2IP 9H 3ER 1BB 7K. Bobby Shore – RHP – Oklahoma – Sr. 3.2IP 3H 0ER 2BB 6K. Matt Stites – RHP – Missouri – Jr. 8IP 9H 5ER 2BB 5K. (L, 1-2). Jed Bradley – LHP – Georgia Tech – Jr. 6IP 7H 2ER 2BB 8K. Bradley was good but Jackets fall to Duke. Tyler Wilson – RHP – Virginia – Sr. 7IP 5H 0ER 2BB 10K. (W, 4-0). Kent Emanuel – LHP – North Carolina – Fr. 6.1IP 8H 1ER 2BB 6K. Freshman takes another step forward against Clemson. Matt Barnes – RHP – Connecticut – Jr. 8.2IP 3H 1ER 1BB 7K. (W, 5-2). 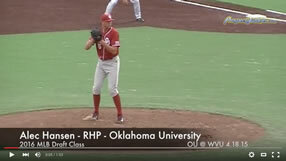 Kyle Hansen – RHP – St. Johns – So. 6.2IP 11H 4ER 1BB 3K. (L, 3-3). Randy Fontanez – RHP – USF – Sr. 8IP 5H 1ER 1BB 3K. (W, 3-2). Elliot Glynn – LHP – Connecticut – Sr. 5IP 4H 3ER 1BB 5K. Matt Purke – LHP – TCU – So. 8IP 6H 1ER 3BB 6K.